Diamond paste compound helps give your tools a smooth mirror like finish. Apply paste to a flat block of maple or leather to achieve mirrored beveled edge. 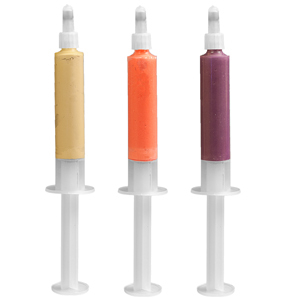 5 gram syringes diamond polishing or lapping paste set. Oil based, easy for use and avoid contamination. Suitable for use on jewelry & gemstone, steel & hard metal, aluminum & zinc, all metallurgical purpose.